This article is about the duck. You may be looking for the orangutan. One of Donald's three nephews. Huey is the leader, and he keeps playful Dewey and laid-back Louie in line. You can spot Huey by his trademark red cap. One of Donald's three nephews. Always wears a blue cap. Cheerful and easygoing. He works with his brothers in a shop in Traverse Town. One of Donald's three nephews. Works with his brothers in a shop in Traverse Town. Gentle and carefree, but notices a lot of things others miss. To find him, look for a green cap. 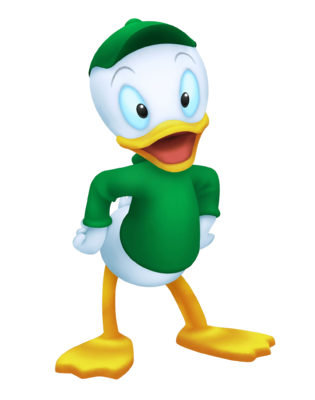 One of Donald's three nephews, Huey is the leader of the bunch. He keeps Dewey's plans in line and makes sure Louie doesn't fall behind while they help out with Uncle Scrooge's ice cream business. You can spot him by his trademark red cap. The last time we saw Huey, he was working in Traverse Town, saving up for an expedition. One of Donald's three nephews who's helping out with Uncle Scrooge's ice cream business. Dewey always wears a blue cap. He's smart and cheerful and likes to come up with plans to have fun. The last time we saw Dewey, he was working in Traverse Town, saving up for an expedition. One of Donald's three nephews helping out with Uncle Scrooge's ice cream business. Louie is gentle and carefree, but notices a lot of things others miss. To find him, look for his green cap. The last time we saw Louie, he was working in Traverse Town, saving up for an expedition. One of Donald's triplet nephews. He calls the shots at the ice cream shop he runs with Dewey and Louie. They're trying to save up for a big adventure. Step one: thinking up hit ice cream flavors no one's ever tasted before! One of Donald's triplet nephews. He runs an ice cream shop with Huey and Louie. They're trying to save up for a big adventure. It was Dewey's idea to combine rhythm and ice cream to attract customers. One of Donald's triplet nephews. He helps out in his own easygoing way at the ice cream shop. They're trying to save up for a big adventure. One of Donald's three nephews. Can't tell Huey apart from the others? Just look for the red clothes. He thinks it's his job to keep Dewey and Louie in line, but in Traverse Town, it's really Cid who looks after all three of them. One of Donald's three nephews. Can't pick Dewey out of the crowd? He's the one in the blue clothes. Dewey is the brains of the bunch, so even though he doesn't always mind Cid, he knows an opportunity to learn when he sees one. One of Donald's three nephews. Not sure which one is Louie? Keep an eye out for the green clothes. Louie is the most laid back of the three — but if you ask Cid, who looks after them, that's not saying much. One of Donald's triplet nephews, known for his trademark red cap. He runs a gummi block shop together with his brothers. One of Donald's triplet nephews, known for his trademark blue cap. He runs a gummi block shop together with his brothers. 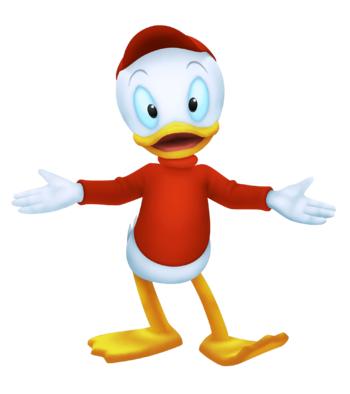 Huey, Dewey, and Louie are the three nephews of Donald Duck, and great-nephews of Scrooge McDuck. In Kingdom Hearts, they work in the item shop in the First District of Traverse Town. Here, the three take turns selling items. In Kingdom Hearts II, they run an item shop, a weapon shop and an accessory shop in Radiant Garden. Huey is in charge of the accessory shop, Dewey is in charge of the item shop and Louie is in charge of the weapon shop. In Kingdom Hearts III, they run a Gummi shop in Twilight Town which was formerly an accessory shop. The trio appears in Disney Town participating in the world's mini games. Scrooge McDuck has left them in-charge of an ice-cream machine, which they are having trouble handling. Captain Justice comes to lend them a hand, but only ends up with making a big mess. When Pete fails to get the machine to properly work, Ventus arrives and asks if he could try getting it to work. With his help, the trio manages to make it work properly. They are later present during the Million Dreams Award presentation, hoping they'll win due to all their hard work around town with the ice-cream machine. They cheers soon after when it's announced that Terra, Aqua, and Ventus all three won the award. Some time after the defeat of Terra-Xehanort, the trio race on the Rumble Race ground, with Huey as the victor. In Traverse Town, the trio has opened an item shop. Judging by conversations with the three, one can clarify that the three brothers went off to seek their fortune. They tell Donald that they wished to make money so that they could travel on a real adventure and therefore went off to start their shop. They also made it clear to their uncle: "No family discounts." After the defeat of Ansem, they are seen returning to Disney Castle. After parts of Hollow Bastion has been restored, the trio shows and opens each their own shops. After Sora and Riku have vanquished Xemnas, Huey, Dewey and Louie are seen once again returning to Disney Castle along with King Mickey, Goofy, Donald, Scrooge, Jiminy Cricket, and Pluto. Data versions of Huey, Dewey, and Louie appear during Data-Sora's adventure in Data-Traverse Town. Data-Cid is looking for them when Sora shows up and asks Data-Sora to look for the triplets. Huey, Dewey, and Louie traveled with Scrooge McDuck to Twilight Town. They sell Gummi Blocks out of what used to be the accessory shop run by Jessie. Huey, Dewey, and Louie are virtually identical to one another except for the color of their clothes. They are a trio of small, anthropomorphized ducks with yellow-orange beaks, legs, and webbed feet, four-fingered hands, white plumage, thin, grey "eyebrows", and light blue eyes that almost seem to glow. Each wears a long-sleeved turtleneck shirt and baseball cap. Huey's cap and shirt are red, Dewey's are blue, and Louie's are green. Despite being depicted as kids in Kingdom Hearts, the trio still exist ten years in the past (during the events of Kingdom Hearts Birth by Sleep), living in Disney Town. This suggests that they may be older than they look or the flow of time is different in Disney Town. 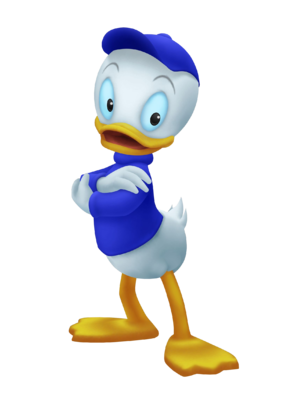 Huey, Dewey, and Louie appear in several animated cartoons and comic books published by Disney. They first appeared in a newspaper comic strip in 1937 and their first animated appearance was in the theatrical short Donald's Nephews, released in 1938. This page was last edited on 18 March 2019, at 05:56.